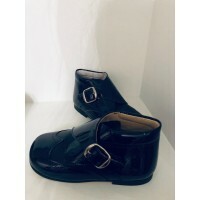 Boys Pretty Originals Patnet Ankle Boots With, Silver Buckle to the side Avaliable in Beige Or Navy&.. Boys Beige leather Sandles, with part patent beige to the front straps, Buckle fastening .. Pretty Originals Baby Boys Grey Patent Boots with Buckle detail, and velcrow fastening, european siz.. Boys soft soled pre walker Baby Blue Patent T Bar shoes with buckle detail .. Boys White Patent lace up shoes, with Broge style detail .. Pretty Originals Boys Navy Patient Soft Soled pre walker, Lace up Boots. ..